Journal Reference: Zhang D, Z Wang, P Kollias, A Vogelmann, K Yang, and T Luo. 2018. "Ice particle production in mid-level stratiform mixed-phase clouds observed with collocated A-Train measurements." Atmospheric Chemistry and Physics, 18(6), doi:10.5194/acp-18-4317-2018. 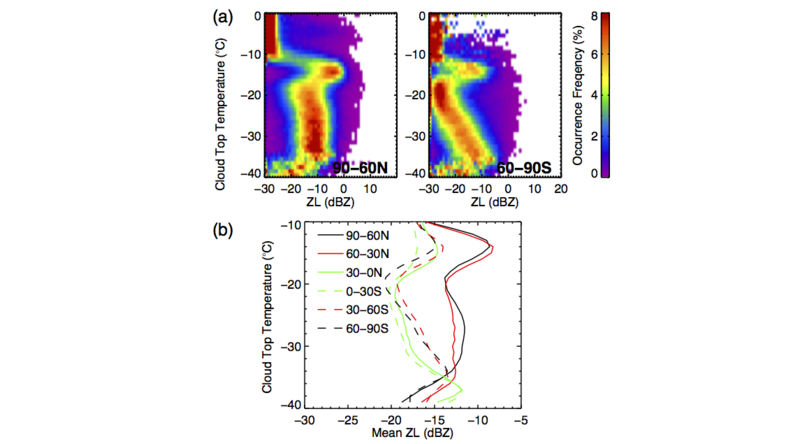 (a) Cloud distributions in terms of cloud-top temperature and layer-maximum radar reflectivity (ZL, a proxy for ice production) for the northern and southern high-latitude regions. Below -10°C, the northern high-latitude ZL is consistently larger than its southern counterpart, indicating a greater amount of glaciation. (b) Mean ZL of clouds as a function of cloud-top temperature and latitude band providing a global view of ice production with the greatest differences at high latitudes. Ice particle production in supercooled liquid clouds has a dramatic impact on the clouds' radiative properties, but it is not well understood and parameterized in models. Mid-level stratiform mixed-phase clouds have a simple dynamic environment and straightforward ice growth trajectory that enables using radar reflectivity measurements to quantitatively infer variations in ice number concentration. Four years of collocated CloudSat radar and CALIPSO lidar measurements are used for a statistical analysis of ice production in mid-level stratiform mixed-phase clouds on a global scale. The results suggest that aerosol-dependent ice concentration parameterizations are required in GCMs to improve global mixed-phase cloud simulations. The findings can be used to evaluate global ice concentrations in mixed-phased clouds and aerosol impacts simulated by GCMs. Single-layer stratiform mixed-phase clouds detected with collocated CloudSat radar and CALIPSO lidar measurements are analyzed to study their ice production. For similar clouds in terms of cloud-top temperature and liquid water path (LWP), differences in the layer-maximum radar reflectivity (ZL) below the liquid layer are used to quantify variations in ice number concentration. After removing contributions from atmospheric pressure differences, ZL is up to 6 dBZ larger for the northern mid- and high latitudes than their southern counterparts, which suggests a factor of 4 higher ice number concentrations (on average). The systematically larger ZL and higher ice number concentrations in mid-level stratiform mixed-phase clouds over the Northern Hemisphere are possibly related to larger background aerosol loadings. As LWP has a significant impact on measured ZL, it is shown that within a given narrow LWP range, mean ZL over northern-latitude bands are always larger than their southern counterparts. Furthermore, the northern mid- and high latitudes have dramatic seasonal variations in ZL, where ZL can be up to 6 dBZ larger in springtime than in wintertime. This increase is shown to coincide with dust events during springtime, suggesting that dust may be providing a source of effective ice nucleating particles.